I am venturing into unknown territory in this post. I have to admit that normally I am not a great fan of taarab music. I suspect this may be because most of the recordings I have heard are too sedate, too polite. I have - with a, over time, growing reluctancy - heard quite a number of taarab recordings, and have come to the conclusion that "let's go crazy" hardly seems to apply to the taarab music I have heard. 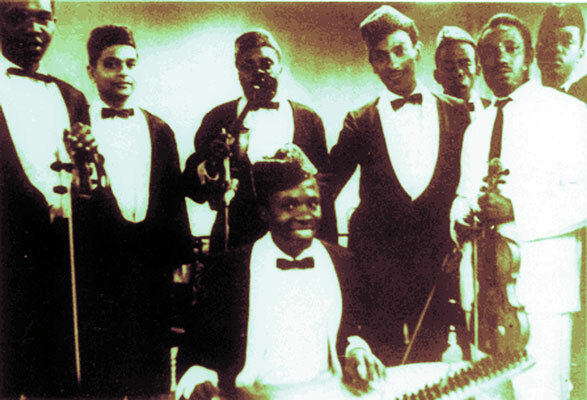 The more modern recordings even appear to have suppressed the passion and spiritual energy which can be detected in older recordings like those of the classic "Songs The Swahili Sing" collection. The cassette I would like to share with you in this post carries the title of "Best of Taarab Songs Vol.1". And this may sound pretentious, but I prefer to see it as a challenge: if you have better taarab songs, please share them with us!! The cassette was bought by a friend in Nairobi in 1988. Apart from the titles the cassette contains no information about artists, so there is another challenge in this: can anyone help us out with the artist(s)? I wouldn't be surprised, by the way, if the whole cassette was by the same group. Among the songs that stand out amidst this wealth of quality taarab songs are a speedy "Mbona Mwatufuja", a piercing "Mapenzi Yaku Nichumu", a spine tingling "Zuhura" (a reference to the singer?) and a strangely haunting "Roho Yangu". Know only one thing : 'Zuhura' is the Kiswahili word for the star Venus. Feel the different songs are by different singers, not members of the same group. I'm no expert on taarab either, but the Zuhura song title may refer to Zuhura Swaleh, a taarab singer who recorded for the Kenyan label Pwani in the mid-1970s and who may also be the lead singer with Zuhura and Party who recorded for Polydor in East Africa in the mid-1980s. Thanks for what I think is the first Taarab posting @ wrldrv. I am a fan of the genre. I particularly love the 'old school' Taarab where they used authentic instruments. I have heard 3 of the 14 songs you have posted, although my tape was similarly unmarked, songs #1a & 1b sound like Shakila Said. Regarding the Song Zuhura, I can confirm beyond any reasonable doubt that it isn't Zuhura Swaleh. The voice of the lady is not Zuhura's, the lyrics of the song are on the surface about the planet venus and finally, Taarab singers rarely sing about themselves. Regarding the question on whether there is better Taarab, although this uploaded compilation is great, I rate Malika Mohamed & Zuhura Swaleh's works above this compilation. But that may be from a biased point of view since I am more exposed to Kenyan Taarab compared to the Zanzibar variety. Taarab songs rarely use common prose, they employ a lot of poetry & riddles, so giving a direct translation would be misleading. But I will try to get a few notes on these songs posted soon. It is mostly late 60's to mid 70s Zanzibar taarab featuring real instruments. Taarab is the meeting point between African and Arab culture. This kind of music is a part of the East African skyline. It's very soothing, and the lyrics are ever interlaced with double meanings. With my remark "a reference to the singer?" I was of course referring to Zuhura Swaleh (of whom I hope to post a cassette later). I did not suggest that the song by Zuhura. I am satisfied with the explanation given by Joji. Do you have "Songs the Swahili Sing," on Original Music? The LP release haad a couple of tracks that ended up on GlobeStyle's "Nyota" (Black Star & Lucky Star Musical clubs). Definitely worth tracking down - meaning the different iterations of Songs the Swahili Sing + Nyota. Overall, I think Werner Graebner and Ben Mandelson have concentrated on chamber music-ish taarab. I wish cassettes made during weddings would turn up somewhere - that has to be much more fun than the usual studio-ish recordings (love them though I do). Now that I've heard most cuts... I'm guessing this was recorded in either Dar Es Salaam, or maybe in Kenya (Mombasa)? it has a Mombasa feeling - lots of Hindi movie musical influence, even a ghazal-ish cut ("Zuhura")! "Zuhura" is performed by Juma Bhalo who often recorded in Old Mombasa Swahili language called Kimvita. He leans more towards Hindu rhythms. One needs a good Swahili vocabulary to really appreciate Taarab music which is Swahili poetry (Mashairi) put to song. Thank you so very much for posting this cassette.